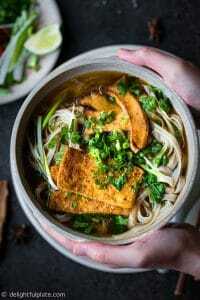 Vietnamese Vegan Pho Noodle Soup (Pho Chay) can be hearty with deep savory flavors. While this vegan pho is quicker to make than traditional beef pho, it is just as comforting and delicious. A few weeks ago, I shared a photo of my bowl of Vietnamese beef pho on Instagram. Then I was asked if I had a recipe for vegan pho (phở chay). Up until that point, I had neither cooked or eaten vegan pho. Being exposed to quite a lot of amazing vegan/vegetarian dishes recently, I felt determined to create a vegan version of pho noodle soup. To my surprise, it wasn’t super challenging, and the result was absolutely satisfying and tasty. I really enjoy all aspects of it, from the vegetable-based broth to the vegan toppings. So, let’s touch on the main elements of this vegan pho before jumping to the recipe. 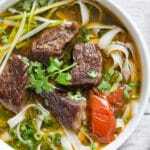 What is the most important element of Vietnamese pho noodle soup? Of course, it’s the broth. The answer is the same for vegan pho noodle soup. And how does regular beef pho broth taste? It’s aromatic, flavorful, hearty, savory with sweetness from simmering bones for hours. Since vegetables are naturally sweet, it’s quite easy to replicate the sweetness. 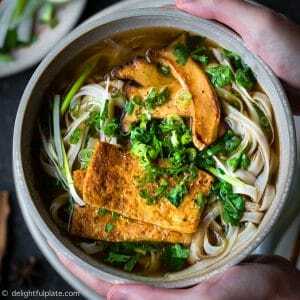 The challenge here is how to make a hearty, flavorful and savory vegan pho broth while vegetable broth is usually on the light side. Through my experiments, I find that using mushrooms creates the hearty, meaty taste for the broth extremely well. I use fresh white mushrooms, and I recommend you do the same. I initially used dried shiitake mushrooms and then found out it wasn’t a good idea. The reason is dried shiitake mushrooms will make the broth way too dark, almost like soy sauce. As we all know, pho broth is never that dark. 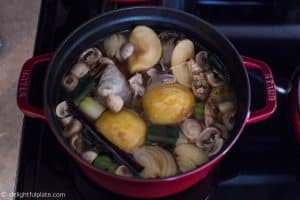 To make the broth flavorful, savory with umami just like how fish sauce works in regular pho noodle soup, I also use kombu, soy sauce, and fermented black beans. is edible kelp that is used intensively in Japanese cooking to make dashi stock. It is rich in glutamic acid which is responsible for umami. Fermented black bean (douchi) is a popular ingredient in Chinese cuisine. If you love mapo tofu (like me 🙂 ), you probably know about fermented black beans already. They are slightly pungent, very salty and full of umami. You can find kombu and fermented black beans at Asian grocery stores. 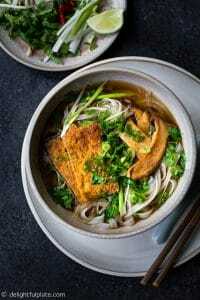 They are both essential ingredients to give this vegan pho broth deep savory flavors and umami. Using soy sauce alone isn’t quite as good, so I think it’s worth a trip to Asian grocery stores to buy them. We also use all the well-known pho spices here, which are cinnamon/cassia bark, star anises, cloves, fennel seeds, coriander seeds and black cardamom pods. Some of them can be bought at regular grocery stores, and you can also buy all of them at Asian grocery stores or on Amazon. The most two important spices are cinnamon sticks/cassia bark and star anises. It’s okay if you don’t have the rest on hand. And of course, we can’t forget the charred onion and ginger when making any pho noodle soups. 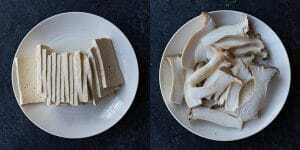 The toppings for this vegan pho are king trumpet/king oyster mushrooms and extra-firm tofu. They are thinly sliced, fried or pan-seared and then infused with pho flavors. They turn out very tasty and even though I’m not vegan, I don’t feel like missing the meat at all. 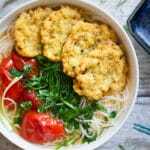 I like to use large pho noodles, and you can go to my pantry page for Vietnamese pho noodles to read more about it and my favorite brand. I always serve pho with a lot of sliced scallions, some cilantro and onion slices. 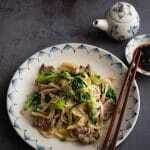 You can also add beansprouts, birds-eye chili, lime juice, or other vegetables and mushrooms you like. So far it sounds like a lot of work to make this vegan pho, but it really isn’t. 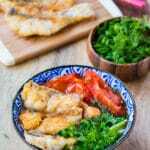 The broth requires only 30-40 minutes of simmering, and during that time you can prepare the toppings, noodles and garnishes. Making beef pho (both the traditional beef pho soup and the beef stew pho soup), on the contrary, takes hours. More importantly, nothing is compromised in this vegan pho noodle soup. I honestly don’t miss the bone broth, the beef slices or fish sauce at all when eating this. So even if you are not vegan, I hope you will give this a try. It is definitely among my most favorite pho noodle soups :). This vegan Pho Noodle Soup (Pho Chay) is so hearty with deep savory flavors. While this vegan pho is quicker to make than traditional beef pho, it is just as comforting and delicious. Char (or broil) onions and ginger until fragrant (about 7-10 minutes when broil on high). Remove the charred, black skin from the onions and set aside. Optional step: Toast all the spices in a pan with medium low to medium heat for a few minutes until aromatics. Put them in a spice bag (so that it will be easier to remove them later). Use damp paper towel to gently wipe the kombu. Add water and kombu in a stock pot. Turn on the stove and when the water starts simmering, discard the kombu. Add carrots, leek, celery, apple, mushrooms, charred onion, ginger and the spice bag to the stockpot. Put the fermented black beans into a spice bag and add it to the stockpot. Also add salt and olive oil, bring everything to a boil, and then lower the heat to a simmer. Cover and simmer for 30-35 minutes. After 30-35 minutes, remove all veggies and spices from the broth. Add soy sauce, taste the broth and adjust to your liking. While the broth is simmered, prepare the toppings. Wrap the tofu block in paper towel and place a heavy object on top of it to squeeze out excess water for a few minutes. Then cut into thin slices. 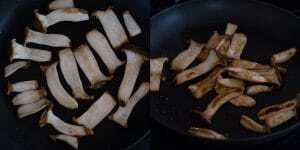 Also cut the king trumpet/king oyster mushrooms into thin slices. 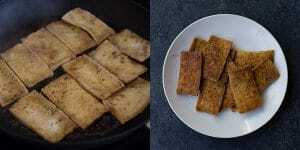 Pan fry the tofu slices until both sides are golden. Transfer to a plate lined with paper towel to absorb excess oil. Set aside. After the broth is ready, place a pan over medium high heat and pan sear the mushrooms on both sides until they develop nice color and are cooked through. Reduce heat to medium, add 1/4 cup of broth and a teaspoon of soy sauce to the pan. Quickly stir fry the mushrooms until all liquid is absorbed. Transfer to a clean plate. In the same pan over medium heat, add tofu slices, about 1/4-1/3 cup of broth, the remaining soy sauce. Cook until all liquid is absorbed, flip once. You may need to cook in 2 batches depending on the amount of tofu and the size of the pan. Cook pho noodles according to package instructions and prepare all the garnishes. Add pho noodles to serving bowls, top with tofu slices and king trumpet/oyster mushroom slices, plenty of scallions and cilantro. Bring the broth back to a boil and ladle into the bowl. Serve immediately with other garnishes of your choice. 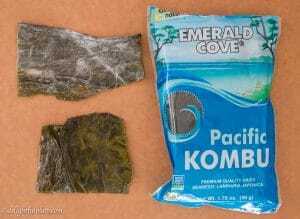 Kombu is edible kelp that is used intensively in Japanese cooking to make dashi stock. It is rich in glutamic acid which is responsible for umami. The most two important spices are cinnamon sticks/cassia bark and star anise. It’s okay if you don’t have the rest on hand. Hi Nicole! Thank you for the comment! If you try it, please feel free to let me know how it goes. I’m so glad to see you here because I like your photos so much. They are gorgeous and often make me feel emotional :).